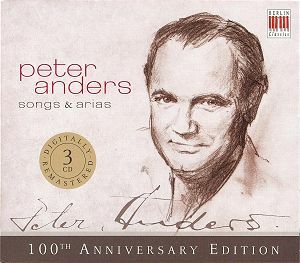 The German tenor Peter Anders was born on 1 July 1908 so this 3-CD set with wartime recordings from German radio archives is an 100th Anniversary Edition. He may not be as well known outside Germany as some other tenors – and there are extra-musical reasons. He rose to fame at a time when the war over-shadowed everything else and hampered, or at least delayed, many promising international careers. He was enormously popular in Germany, appeared only occasionally in other countries, became a favourite by the Nazi regime, which soiled his reputation after the war and when he was at the height of his powers, ready for his great breakthrough as a heroic tenor, having started as a Mozart singer, he died in a car crash, aged 46. He was then scheduled to make his Metropolitan debut before long. Fortunately he left behind a comprehensive recorded legacy, having been an exclusive Telefunken recording artist from the mid-1930s, later recording for Electrola and in the 1950s for Deutsche Grammophon. I got to know him in the very infancy of my record collecting, finding in a shop a reduced price 10-inch LP with some of his Mozart recordings from 1935 or -36. This happened to be my first recordings of any Mozart arias and even though he sang everything in German – also Don Ottavio’s two arias from Don Giovanni – I found great pleasure in his singing: a beautiful, well schooled voice, ringing out with freedom and lyrical warmth and elegance, and excellent enunciation. Much later I came by a double LP on Acanta with a wartime recording of Schubert’s Die Winterreise, which I have ever since regarded as one of the best readings of this multifarious work. Some years ago I reviewed a Preiser CD with more material from radio archives as well as some Electrola and DG recordings from the early 1950s. The criticism I had then is applicable also to the present box. The quality of his voice is never in question but he has a tendency to overexpose it, to press beyond its natural limits, and too often his highest notes become pinched. He is also sometimes overemphatic which mars his otherwise excellent Mozart recordings on CD 3. All three arias were also on that Telefunken LP and when I dusted off that old friend I met a more classically balanced Mozart singer, lighter of touch. The romance from Die lustigen Weiber von Windsor is marred by an uncommonly harsh recording with the voice fairly distant, the harp close to the microphone and a fizzy edge to voice and strings. He also sounds strained and he lacks the poetry that should be found in a good Fenton. His Hoffmann is sensitive and in the duet with Antonia he is partnered by an Erna Berger in good form. The excerpts from La bohème, sung of course in German, are in effect two scenes: the first encounter between Rodolfo and Mimi in act I, from her knock on the door till the end of act – but there are no other Bohemians between Mimi’s aria and the love duet. The excerpt from act III (CD 3 tr. 12) begins just before Mimi’s second aria. Mimi here is the once famous Maria Cebotari, who died from cancer in 1949, not yet forty. An extremely beautiful woman she also had a career as a film actress but she was indeed a superb singer as well. Her somewhat fluttery tone can initially be off-putting but she sings with glow and when she lets go in her arias I believe more listeners besides myself get goose-pimples. Anders is an ardent and sensitive Rodolfo but he sounds uncomfortable on the highest notes and the high C is pinched. Once there was on a DG 10-inch LP a recording of this first act scene with Anders and Cebotari (17 205 LPE) but I can’t believe it’s the same recording. It should also be said that Anders wisely sings the lower option at the end of the duet instead of following the soprano up to the high C.
The German composer, conductor and theatre director Max von Schillings is probably best known for his opera Mona Lisa, premiered in Stuttgart in 1915. It was a great success and even reached the Metropolitan Opera. His Glockenlieder (Bell Songs) was a new work to me and they are well worth a revival. A recording in modern sound might be a revelation. The tonal language is late romantic: two tablespoons of Wagner, one heaped ditto Richard Strauss with some Puccini rippled on top. A rather tasty mix, skilfully orchestrated and the singing is in a recitative like parlando style, rather operatic. Peter Anders obviously liked the songs and is in excellent form, producing strong heroic singing. The cycle is cleverly squeezed in between the Bohème excerpts and Strauss’s Morgen, sung as an encore, beautifully and mostly with his exquisite half-voice. All in all there are swings and roundabouts on this third disc but actually more to admire than to be irritated by. One irritant, throughout the set, is of course the quality of the sound. Recorded during wartime conditions the tapes suffer from a great deal of distortion and the digital remastering hasn’t been able remove all the defects. But it is a decent sound and readers accustomed to historical reissues won’t be much offended. The ‘fizz’, the edge on the voice is there more or less on all the numbers in this set but it is less irritating on the fist two discs, devoted entirely to German Lieder, where Peter Anders is accompanied by probably the greatest accompanist of the period, the indefatigable Michael Raucheisen. He was born in 1889 and from the beginning of the 1920s until the end of WW2 he was accompanist for the cream of the German speaking Lieder singers, including Frida Leider, Erna Berger, Elisabeth Schwarzkopf, Karl Erb and Helge Rosvaenge. He married soprano Maria Ivogün in 1933 and from that same year he saw it as the task of his life to get as many German songs as possible recorded. His collaboration with Peter Anders was fruitful indeed, and just as the Winterreise mentioned above, it is the Schubert songs, occupying all of CD 1, that are the pinnacle of Peter Anders’s achievement here. Apart from some unnecessary intrusive ‘h’s his singing is spotless, lively and expressive and sung with ‘face’. Readers who want firm proof to this should listen to Im Frühling, with phrasing and actual tone so marvellously adapted to the song. Of contemporaneous tenors he is actually comparable to the great Aksel Schiøtz – and I can’t think of higher praise. In Das Geheimnis his honeyed half-voice contrasts effectively with some Heldentenor brilliance. Der Einsame is a bit stiff but he inserts some elegant grace-notes. The seven songs from Schwanengesang – six of the seven Rellstab settings plus Seidl’s Die Taubenpost show him at his very best with a masterly Ständchen as the crowning glory. He also makes the most of the overlong Der Liedler. On CD 2 the two Beethoven songs are splendid and his Schumann is fascinating, marred only by some overemphasis. Best of them is the sensitive Loreley. In Familiengemälde Tiana Lemnitz sounds throatier than I remember her from other recordings but she nuances well. I’m less sure about his Brahms, where he too often presses too hard, and his Wolf readings don’t seem to have settled enough, but in the two Strauss songs he is in his element again. There are no texts enclosed but the booklet has extensive notes about Peter Anders. All is not gold that glitters on this set but there is enough of that genuine article to make this an enticing proposition – in spite of my reservations.